The winners of the 9th Annual Australian Mining Prospect Awards. 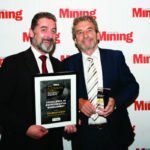 Mine of the Year – Anglo American's Capcoal Surface Operations. Keep an eye out online to find out more about our winners. Australian Mining Prospect Awards are counting down!